I am confused. Please, help me understand. I’m sure you get a lot of letters. In fact, most of them are probably thank you letters. You’re not a terrible state to live in. I realize we’re spoiled. Strawberries are in season. I should probably just shut my face now, right? Oh, well. Now, I’m not writing you to complain about the rain. That would be dumb of me. I know that we are in a serious drought. Bring on the soggy hills and the muddy dog paws. I’m also not totally mad that I can get more use out of my chunky winter sweaters. My spring wardrobe is lacking a bit, so you’re actually helping me out. However, as pro-rain and pro-water supply as I am, I can’t help but be slightly confused by the manic nature in which you seem to be alternating between thunderstorms and hot-hot sunshine. Also, did you really need to make it rain SO hard all the days that my dear Mother In Law came to visit? That was her spring break. We spent it eating soup. We also tried to watch The Wolf of Wall Street. I’m just going to put it out there that it’s never going to be completely comfortable (with Mother In Law in tow) to watch a man snort drugs off the waxed backside of a fully naked lady. That was my fault though, I’m not going to blame you for that one. Of course, now it’s sunny. But not just sunny, it’s sweaty. I have a ferocious slick of upper-lip sweat and I’ve decided to put on a spring dress without consulting my winter legs. These white and shamefully furry ham-hocks could have used a little warning before you turned up the thermostat. Is this The Hunger Games? Are you just switching buttons on and off? Should I be worried about crazy monkeys or a cloud of flesh-eating gas? Do I run for the Cornucopia? Do I pack away the sweaters yet? Last week I started the day in a sundress and ended it in a sundress plus a bathrobe. Confused. So confused. With my confusion in tow, I’ve just decided to keep on baking. Everything seems to make more sense when there’s chocolate. Plus, if I can sneak some veggies into my baked goods I’m all for it. This grain-free bread is pretty much like a salad (false). I totally don’t have chocolate on my face (also, false). If you could get back to me that would be great. I know you’re busy. Also, I know it’s a long shot but my favorite outdoor temperature is seventy two degrees. I also like it when you make the clouds look all pretty and stuff. PS. 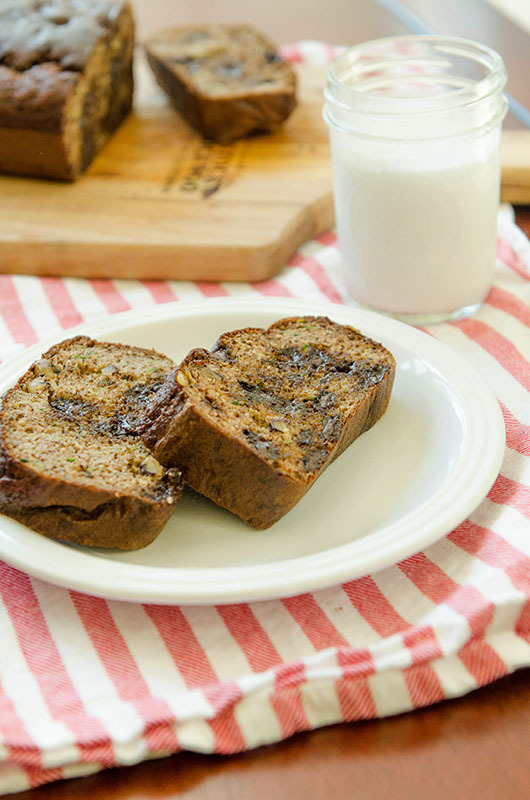 I’ve included the recipe for this grain-free chocolate chip zucchini bread at the bottom of this letter. 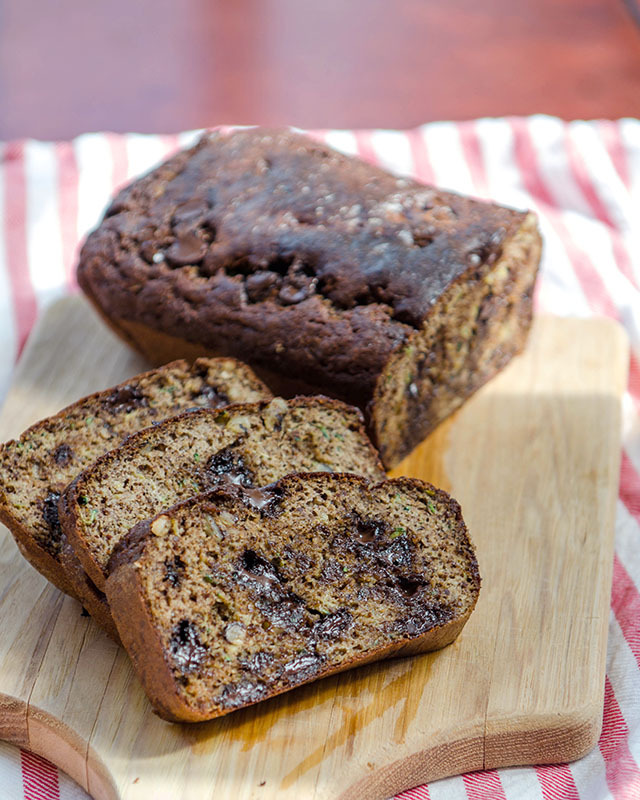 If you are a huge zucchini bread fan, may I suggest that you also check out this recipe for Double Dark Chocolate Zucchini Bread? It’s sinful. Line a loaf pan with a piece of parchment paper and set aside. Combine all of the dry ingredients in a medium mixing bowl. Place your eggs, maple syrup, and banana into a stand mixer. Beat them on a medium speed for a couple of minutes or until your eggs are frothy. Add the zucchini and process some more until the zucchini is combined throughout. While your wet mixture is still running in your stand mixer, slowly add in your dry ingredients until you have completely emptied your bowl into the stand mixer. Allow the mixer to continue to mix until the batter comes together evenly. Fold in your chocolate chips and your walnuts. Pour your batter into your parchment lined loaf pan and bake for 30-35 minutes, or until the outside of your bread is golden in color and the inside is no longer wet. You can test this with a knife or a toothpick. If you puncture the center of your bread and the knife comes out cleanly, it is done. Using the parchment paper as a sling, remove the bread from the loaf pan and allow it to cool for up to fifteen minutes before slicing. Hahahah Gina this was amazing. Never stop being hysterical, please. 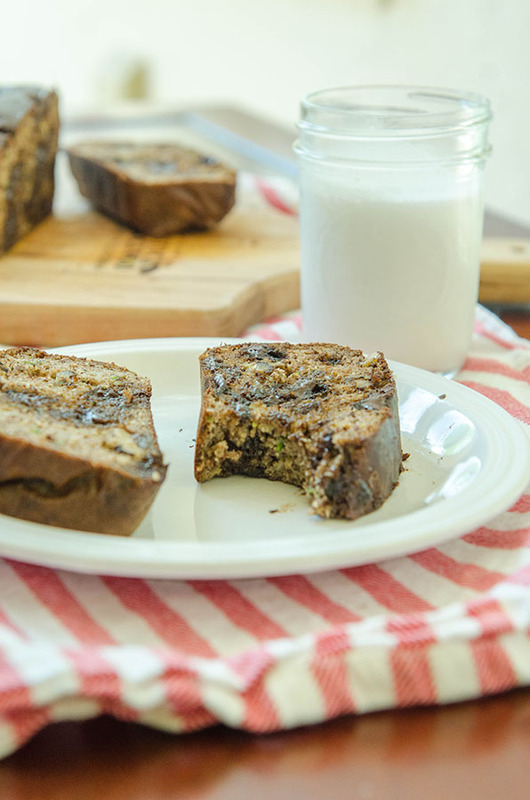 And also this chocolate-chip zucchini loaf-salad looks AMAZING. You slay me. In like a hot, positive, totally inspiring way. Not in a Game of Thrones-y way. Also, I don’t know how this whole new comment math trickery business makes me feel. Other than bad at math. xo! okay, this is INSANELY good. That is all.